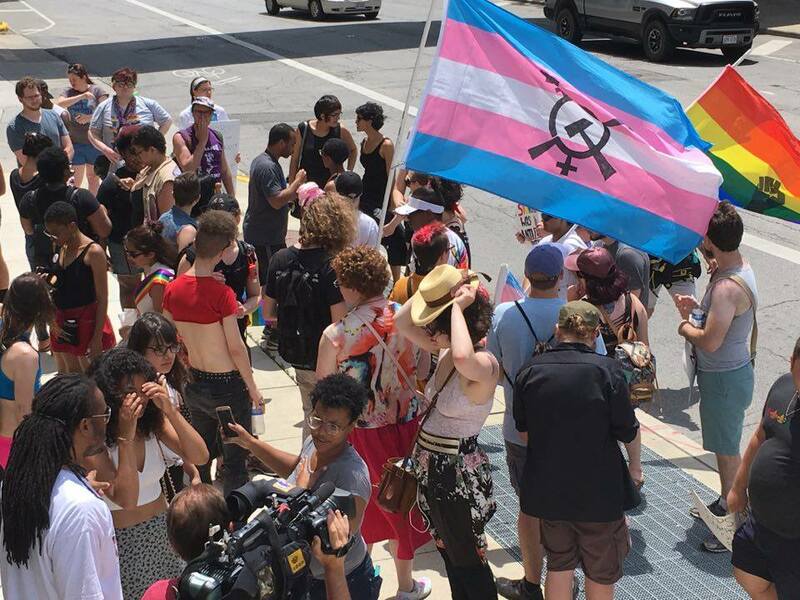 Four protesters were arrested at Columbus Pride yesterday. 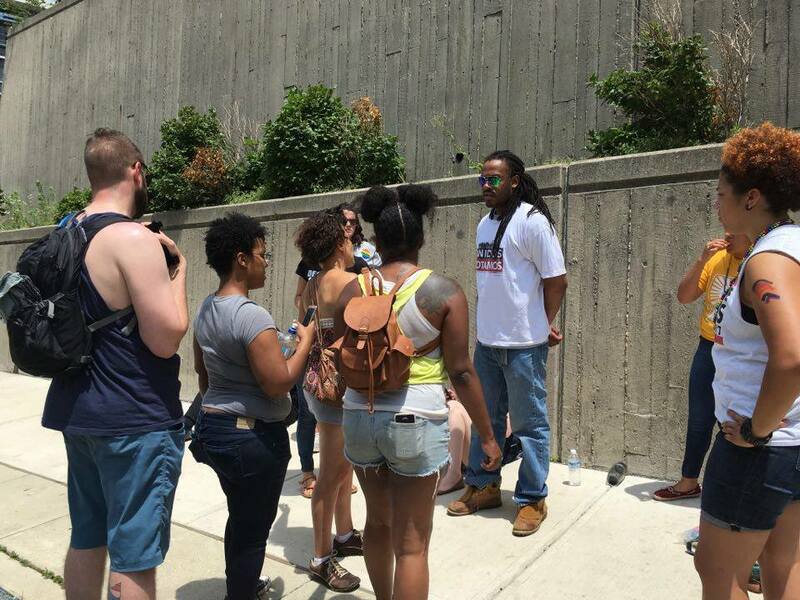 About a dozen people went to the pride parade to protest the acquittal of Philando Castile, an African American man who was shot and killed by police officer Jeronimo Yanez during a traffic stop in Minnesota. On Friday, Yanez was acquitted of second degree manslaughter charges. The protestors also say they were trying to raise awareness of violence against transgender people of color. The protestors joined arms and blocked the parade, explaining that they wanted seven minutes of silence – one minute for each bullet that Yanez shot at Castile. According to Stephanie Ewen, one of the protestors, the parade marchers stopped and were listening to the protestors. Police say they got a report that the parade route was being blocked and officers arrived on bicycles. They used the bicycles to move the protestors in order to clear the parade route. Officers say that four of the protestors didn’t comply and they were arrested. According to Columbus Police, four of the officers were injured while attempting to move the protestors. One officer tore his ACL and will have to get surgery on his knee. According to calls to protest the arrest shared on Twitter, the people arrested – Wriply Bennett, Kendall Denton, Ashley Braxton, and Deandre Miles, or the “Black Pride 4” – are all African American and one is transgender. Bennett, Denton, and Braxton have been released on bail, while Miles is being held on felony aggravated robbery charges because police accuse her of grabbing an officer’s gun. Columbus Police have confirmed that the charges for the four include aggravated robbery, resisting arrest, causing harm to a police officer, failure to comply with a police officer’s order, and disorderly conduct. They have not confirmed the names of those arrested, their race or gender identities, or the charges that each individual is facing. Protestors gathered outside of the Franklin County Courthouse to demand the release of the four people arrested and that charges against them be dropped. One of the protestors who was not arrested, Ariana Steele, posted on Facebook and called the felony charge of aggravated robbery “false.” A protest is planned for Monday morning at the same location. There was a large police presence at the event that attracted 600,000 people yesterday, with 80 officers patrolling the parade area on bicycle. Last week, a comment on Facebook that may have been a bomb threat against the parade caused the local police to contact the Department of Homeland Security.